Torches is the debut album from the newest sensation in indie pop, Foster the People. The LA band features members Cubbie Fink (backing vocals, bass), Mark Foster (keyboards, guitar, vocals) and Mark Pontius (drums), and was created by the same producers who worked with Muse, Adele, and Beck. This ten-track effort can best be described as MGMT-meets-Passion Pit-meets-the funk/groove elements of later 90’s bands, a la New Radicals. “Pumped Up Kicks,” the band’s first single, is frankly the best track on this album, which is surprising as often hit singles portray the minimum a band has to offer. It’s an addictive, albeit disturbing track– think Third Eye Blind’s “Slow Motion” put to a pop beat with less straight-forward lyrics. Supposedly the song was inspired by Robert Hawkins, a boy who went on a shooting spree in a Nebraska mall; hence, the title references all the phony rich kids you’d see at a mall. At minimum, the song could be seen as a satire on the gangster-mentality trend of this generation. All of the above musical comparisons are not meant to portray Foster the People as unoriginal; this is certainly a decent debut effort. Yet too often pop bands get thrown into the “indie” genre simply because they use some synths and are comparably better than the boy-band, bubblegum-pop we all know is terrible. 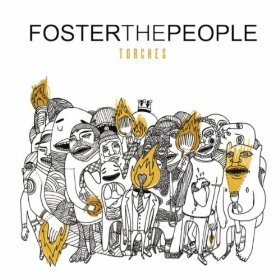 Torches is an undeniably feel-good album, brimming with summer anthems. But the question remains if the band can successfully delve into darker seasons in the future–a seemingly difficult task for artists in their prescribed genre.